I reviewed Ueberschall’s Elatik-based Acoustic Guitar library back in the May 2014 issue of SOS and was suitably impressed with both the performances and recording quality on offer. As you might imagine, Acoustic Guitar 2 is a follow up to that original release and, while the price remains the same (€49 for the library download containing around 1.2GB of sample data), the format of the samples is somewhat different. Like the first release, Acoustic Guitar 2 is not really a construction kit format, but instead provides a number of folder-based themes (‘licks’). Within each of these are three related performance ideas, just as with the first volume. However, there are two differences (aside, of course, from the fact that the music performances are all new!). Firstly, the performances are split into two groups of tempo-based themes at 74 and 120 bpm. Secondly, for each theme, all three performance variations have been played on a different set of multiple guitars. So, instead of the Martin, Yamaha and Ibanez guitars in the original release, here you get five separate versions of each part. These include a pre-mixed stereo loop, a stereo loop with two six-string guitars panned hard left/right, a further stereo loop with two 12-string guitars panned hard left/right and two further 12-string loops. You can, of course, simply use Elastik’s pan options to isolate just one of the guitars in the ‘paired’ loops. Even so, there is also much greater emphasis on the 12-string in Acoustic Guitar 2. Performance-wise, however, the libraries are in the same ball-park, so if you are after some fairly pop-friendly, singer-songwriter guitar performances to work with, then these will be right on the money. 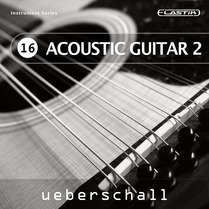 There is perhaps a somewhat more up-tempo feel to this collection, but for an instant dose of contemporary acoustic, Acoustic Guitar 2 is suitably well stocked. It is also worth noting that the Elastik front end has recently had a bit of an engine upgrade; you can, therefore, do a surprising amount of tempo adjustment and still get a very usable audio result. What is impressive, though, is the sound. Whether you want a single guitar for a simple arrangement, or a rich bed of acoustic sounds for something more full-on, the library lets you build it easily and the sounds themselves are really very good. As with any loop-based library, the downside is that you have to work with the performances you are given. In the case of Acoustic Guitar 2, it has to be borne in mind that the headline figure of 500+ loops includes multiple performances of each musical idea (all those different guitars). Even so, given the modest price, and the quality of what is here, Acoustic Guitar 2 still gives those wanting instant acoustics a good crop of choices.